Elvis Presley 1957 Japan EP Good Rockin' EP-1206 RARE! VICTOR EP-1206 CONDITION Cover EX with original outer plastic sleeve DISC EX. Track listing: BLUE MOON OF KENTUCKY, SHAKE RATTLE AND ROLL, GOOD ROCKIN TONIGHT, I DON'T CARE IF THE SUN DON'T SHINE. THIS IS VERY RARE JAPANESE EP WITH COOL PICTURE SLEEVE. 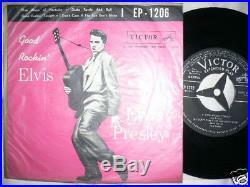 The item "Elvis Presley 1957 Japan EP Good Rockin' EP-1206 RARE" is in sale since Wednesday, July 01, 2009. This item is in the category "Music\Records". The seller is "tokyorecords" and is located in Tokyo. This item can be shipped worldwide.